Welcome to the definitive sports rankings podcast. In each episode, we rank things: sports teams, players, seasons, free agents, storylines, draft picks, moments, etc. Download an episode and join the debate! Zac (@ZacCrippen) and Pete (@Pete_Laclede) preview some key things to watch in tomorrow's Super Bowl matchup, including: - Aaron Donald, Ndamukong Suh and the Rams' defensive line vs. the Patriots' offensive line - Julian Edelman on crossing routes - The Patriots' secondary and linebackers dropping back in coverage - McVay's offensive scheming vs. Belichick's defensive masterminding - Romo's big day What'd we miss? Let us know at lineup@vernacularpodcast.com or @TheLineupPod. Zac (@ZacCrippen) and Pete (@Pete_Laclede) review the 12 playoff teams in the NFL playoff field and review, from "worst to first," what their Super Bowl chances are. What'd we miss? Let us know at lineup@vernacularpodcast.com or @TheLineupPod. Zac (@ZacCrippen) and Pete (@Pete_Laclede) conduct a draft of the best sports moments of 2018 and then briefly discuss some sports things they hated in the past year. Mentioned in this episode: - Washington Capitals' Stanley Cup - St Nick and the Eagles' Super Bowl - Baker Mayfield transforming the Browns - Shaquem Griffin being drafted - Tiger's first PGA tour victory since 2013 - Shohei Ohtani as the first two-way player in decades and much more! What did we miss? Tell us at lineup@vernacularpodcast.com or @thelineuppod! The Lineup: The Sports Rankings Podcast is coming to you on 12.20.18! 3rd String: NFL Week 10 "Dime a Dozen"
Zac (@ZacCrippen) and Pete (@Pete_Laclede) run through a "Dime a Dozen" segment and give you their picks for a high payoff 12-game parlay of NFL weekend action. Zac (@ZacCrippen) and Pete (@Pete_Laclede) discuss the glories of October baseball and talk about the Red Sox/Dodgers matchup, dissect the Saquon Barkley draft decision in retrospect, argue about whether or not the NFC East is the worst division in football, and talk about the surprises of the year. (And, Zac adds, the Browns' 2.5 win total is *not* one of those surprises.) ICYMI: Here is the Peyton Manning video Pete mentioned. Welcome to the Takes of The Game NBA Season Preview for the 2018-19 season. Taylor and Ishan open with a discussion on Jimmy Butler's practice tirade in Minnesota yesterday before wondering if player empowerment has gone too far. Then, Taylor laments the loss of DeJounte Murray and the implications for the Spurs' already-sad season. The guys give us their individual awards predictions before breaking the league down into various team tiers. Finally, they give us their predictions for the conference finals and eventual champion. Put on your sun screen--the takes are blazing hot! Zac (@ZacCrippen) and Pete (@Pete_Laclede) discuss the opening salvo of the MLB playoffs, including the Cubs' impressive collapse, the clash of the Titans in Boston and the Bronx, the phenoms on the Braves' roster, and the small-market team who is their favorite to advance to the World Series. Ishan takes us down memory lane and tells us where his affection for Jimmy Butler began. That leads the guys on a deep dive into Butler's trade demands. They debate who's to blame for the bad blood betwen Butler and The Wolves and talk about where Butler could go from here. Then Taylor and Ishan give the "island" takes on which they find themselves all alone heading into the new NBA season. 3rd String: NFL Week 3 "Dime a Dozen"
Zac (@ZacCrippen), Pete (@Pete_Laclede), and Ishan (@jimmyluandtaj) discuss the NL playoff race, Ohtani the two-way phenom who continues to bat despite a torn UCL, the Athletics' impressive ability to keep finding an edge with one of the lowest payrolls in baseball, and the close race for NL Rookie of the Year. Zac (@ZacCrippen) and Pete (@Pete_Laclede), true NFC East homers, break down why the Cowboys and Giants are in horrendous trouble: Did you know that 11% of the Giants' roster was added after the end of the preseason? Did you know that 50% of Dallas' offensive line is injured? The guys also identify stories to watch with the Washington Redskins and the [Super Bowl Champion] Philadelphia Eagles. In this episode, 3rd String Benchwarmers Zac (@ZacCrippen), Ishan (@shouldakeptJB), and Taylor (@TheTYoung) host a live discussion about all things fantasy football while the 3rd String draft progresses through ten rounds. Hear the reaction to the shocking #2 overall selection, the kicker drafted in the sixth round, the good old days of Shannon Sharpe, and divergent thoughts on draft philosophies. Zac (@ZacCrippen) and Pete (@Pete_Laclede) preview the NFC/AFC West, breaking down storylines for each team and talking about the "X-Factor." Will the Rams reign supreme? Are the Seahawks in true rebuild? Is Denver back? Hear all of these discussions and more, and let us know what you think. Zac (@ZacCrippen) and Pete (@Pete_Laclede) preview the college football season in advance of kickoff weekend, exploring storylines, teams, and personalities to watch in each of the Power 5 conferences. Is this the year for Tom Herman's Texas squad to take a big step forward? What about Justin Fuente's Hokies? are Alabama and Georgia destined for a CFP rematch? (We hope not.) Is James Franklin underrated? Hear all of these and more, and join the conversation on Twitter! Full Count: Is baseball too white? In this special National Ice Cream Day/Home Run Derby edition episode, Zac and Pete draft their Home Run Derby teams and discuss their favorite ice cream flavors after Pete ate his own weight in ice cream at a Vegas ice cream festival (Zac routinely eats his own weight in ice cream, so he is also qualified to discuss these matters.) And a draft spoiler alert: Pete is a Bryce Harper homer (typical) but Zac beats him to the punch. We're also building a Facebook Group! Join here. In this episode, Zac and Pete banter about World Cup Soccer, Kirk Cousins, and D.C. sports, and debate the snubs of the All-Star Game. You can find the full All-Star Game rosters here. We're also building a Facebook Group! Join here. Zac (@ZacCrippen), Pete (@Pete_Laclede), and Ishan (@shouldakeptJB) answer a listener question about unwritten rules in baseball, banter about Dexter Fowler's rocky tenure in St. Louis, conduct a midseason evaluation of the MLB playoff race, anoint a new anti-three true outcome king, and make completely ignorant and uninformed World Cup predictions. Send us questions and comments! Zac (@ZacCrippen) and Pete (@Pete_Laclede) talk about the best baseball movies of all time, summer in Vegas and Austin, the designated hitter coming to the NL, Zac's terrible DH idea, pace of play changes, and round two of Pete's journey on the Lane Kiffin Hype Train. Don't miss out on The Popped Cast, the new pop culture podcast from Vernacular! Zac (@ZacCrippen) and Pete (@Pete_Laclede) talk about the MLB season so far, including the resurgent Astros, the slumping Bryce Harper, and Clayton Kershaw's attempt to return from a back injury. Then Zac brings Taylor (@theTYoung) on to talk about the latest Kawhi Leonard reports and the impact on the NBA's future. Don't miss out on The Popped Cast, the new pop culture podcast from Vernacular! In part two of this special Father's Day episode, Zac (@ZacCrippen), Pete Laclede (@Pete_Laclede), and Josh Goldman (@GoldmanStandard) talk about the defining biography of Tiger Woods and the lessons that fathers everywhere can draw from it. Also be sure to check out Zac's longform piece on Tiger Woods, Golfing in the Dark. Don't miss the Vernacular Podcast Network's newest show, The Popped Cast, launching later this month! Josh and Maureen Goldman host this pop culture addition to the Vernacular lexicon. In part one of this special Father's Day episode, Zac (@ZacCrippen), Pete Laclede (@Pete_Laclede), and Josh Goldman (@GoldmanStandard) talk about the defining biography of Tiger Woods and the lessons that fathers everywhere can draw from it. Also be sure to check out Zac's longform piece on Tiger Woods, Golfing in the Dark. Don't miss the Vernacular Podcast Network's newest show, The Popped Cast, launching later this month! Josh and Maureen Goldman host this pop culture addition to the Vernacular lexicon. Zac (@ZacCrippen), Ishan (@shouldakeptJB), and Taylor (@theTYoung) discuss J.R. Smith's Finals-defining gaffe, LeBron's hand injury and his 2018 destination, Ishan's solution to tanking, and the Eastern Conference team with the best chance to upset the Warriors in the 2018-2019 season. It's the final installment of the Roadtrip Diaries! As Pete's roadtrip winds down and he descends into the Nevada desert, Zac (@ZacCrippen) and Pete (@Pete_Laclede) discuss the Washington Capitals' historic win over the Las Vegas Golden Knights (Pete's hometown team vs his new town team) and the New York Mets' injury woes. We're back next week with better sound quality for more of your favorite sports talk! It's the Roadtrip Diaries Micropod Part 3! As Pete's roadtrip continues, this time from an undisclosed location in Yellowstone National Park en route to Salt Lake City, Zac (@ZacCrippen) and Pete (@Pete_Laclede) talk about bison burgers, mosquitoes, Bryan Colangelo's burner accounts, LeBron in the finals, Terrell Owens turning down the Hall of Fame induction ceremony, and Julian Edelman's looming suspension. It's the Roadtrip Diaries Micropod Part 2! As Pete's roadtrip continues, this time from Billings, MT to an undisclosed location in Yellowstone National Park, Zac (@ZacCrippen) and Pete (@Pete_Laclede) talk about spelunking, NCAA scandals, the Eagles getting disinvited from the White House, Oliver Luck's move to the XFL, and Bryce Harper's disappearing act. It's the Roadtrip Diaries Micropod Part 1! In the middle of Pete's roadtrip from North Dakota to Las Vegas, Zac (@ZacCrippen) and Pete (@Pete_Laclede) talk about Phil Jackson's boyhood hometown in North Dakota, the rugged beauty of a Dakota sunset, Terrell Owen's comeback bid, Jerry Jones vs. Bruce Allen, and Gabe Kapler's Phillies. Zac (@ZacCrippen) and Pete (@Pete_Laclede)break down the Supreme Court’s sports gambling decision just before Pete moves to the gambling capital of the world, preview the unlikeliest Stanley Cup in history, and talk about the Amazon’s newest show, All Or Nothing: The Dallas Cowboys). Be sure to tune in next week for our NBA Finals preview! Zac (@ZacCrippen), Ishan (@shouldakeptJB) and Taylor (@TheTYoung) discuss the Celtics-Cavs and Rockets-Warriors matchups, talking about key players, coaching decisions, defensive ratings, Brad Steven's ingenuity, and LeBron's case for the GOAT (🐐). Zac (@ZacCrippen) and Pete (@Pete_Laclede) take fifteen minutes to break down the latest NHL action (Pete's beloved Caps are going to their first conference finals in twenty years) and talk about the Sixers' future and LeBron's case for the GOAT. Zac (@ZacCrippen) and Pete (@Pete_Laclede) run a mock draft, posing as the GMs of the Browns, Giants, Jets, Broncos, Colts, Bucs, Niners, and Raiders. Zac drops a surprise first overall pick and Pete starts the run on quarterbacks early. What do you think? Drop us a line on Twitter or in the Anchor app! Zac, Pete, and Ishan sit down and talk about some of the surprising and totally expected events of the NBA playoffs so far. Is LeBron in danger of not making the playoffs for the first time since Pete was in college? Are the Sixers for real, like Zac thinks? Can the Pelicans upset the Warriors in round 2? Ishan says it hinges on Steph. It's all here--and more--on 3rd String! Get Ready for the NBA playoffs with 3rd String! In this episode Zac and Pete talk with Taylor Young, a long time Pounding the Rock contributor and die-hard Spurs fan, about Kawhi Leonard’s tumultuous season and some of the NBA’s most exciting matchups this April. Also find out if the guys are all in agreement on Rookie of the Year voting (spoiler: they’re not), whether the Greek Freak will get the help he needs to propel the Bucks, and what the most popular baby name in Philly will be when 2018 comes to a close! Zac and Pete are back, one emergency surgery and one trip to Sin City down, to talk about the week in sports. The guys debate Dez Bryant landing spots, the Ohtani hype train (spoiler, one host yells “whoot whoot”), and bench-clearing "brawls" in baseball. Get ready for a great weekend with 3rd String! Zac and Pete briefly give a nod to Philadelphia's latest championship team, the Villanova Wildcats (0:37) before talking about Chance Sisco's bunt against the Twins' shift in the 9th inning (5:02). Zac also comes out as a bat flip supporter (9:18) and the two guys discuss the Phillies' management woes (13:42), the Cubs' rotation issues (20:30), and the new-look Los Angeles Rams (25:49). In closing, they reveal the NFL-winning strategy for the Browns to employ during the upcoming draft (33:45). On this bonus pod, Zac and Pete welcome “Uncle Saw” back to the show, fresh off his trip to the Mecca of college hoops betting: Mandalay Bay in Las Vegas. The guys discuss what it’s like watching the Round of 64 in a major casino, some interesting winners/losers, and what lines to watch for in this weekend’s Final Four. In the final episode of our MLB preview trilogy, Zac, Pete, and Ishan discuss over/under predictions for each team in the American League and National League West. Will Shohei Ohtani overcome his spring blues? Will Wade Davis be enough to support the Rockies Bullpen? Are the Giants going to be the comeback story of the year? 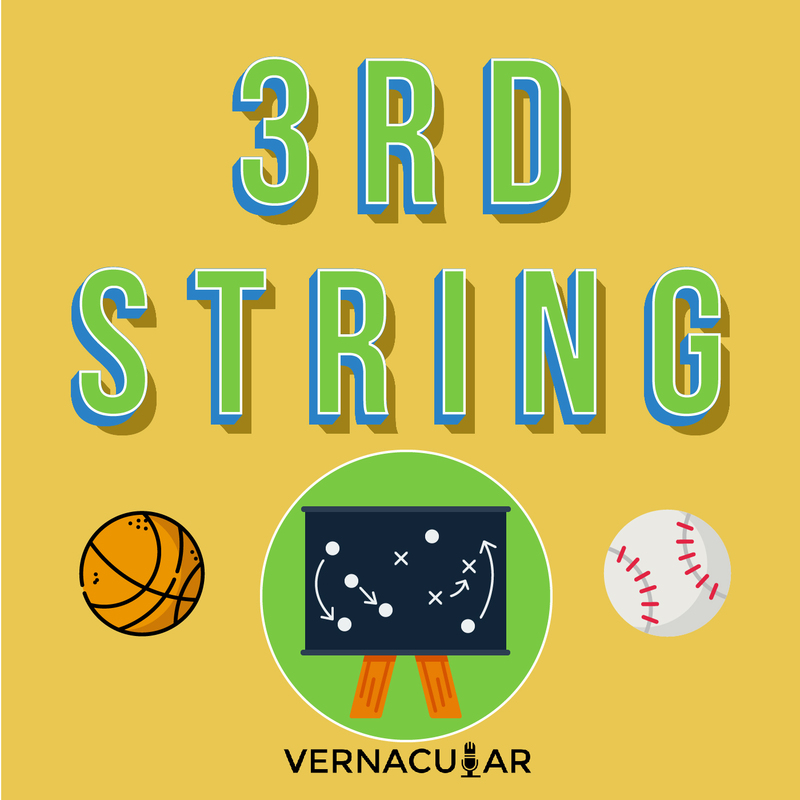 In this episode of 3rd String we break down some of the biggest things you need to know about the American League and National League central divisions. What is Byron Buxton's ceiling? Are the Indians a lock over the Twins? Will Jose Quintana dominate the Cardinals?.Will the Cubs regret letting Arrieta go to Philly? Zac, Pete, and Ishan break down all of these questions and more! It's a great episode, and the perfect thing to get you pumped for Opening Day next week! It's been a crazy NCAA so far. We have First Four teams taking out Final Four favorites, #1 seeds falling to schools whose websites can't handle the traffic, and some traditional blue bloods slowly creeping their way back up to the top. This week the guys have the biggest UVA fan they can find, Josh Goldman, on the show to talk about his experiences in the wake of the historic upset. They also pick out their matchups to watch this weekend, and even debate a little on what the selection committee should be thinking about next year. Get ready for the Sweet 16 with 3rd String! In the midst of Madness and travel, Zac and Pete are back with an emergency pod to talk about the crazy week in sports. From the disappointment of the PAC-12 to the Yankees, to the biggest NFL Free Agent moves, it’s an episode filled with hot takes and predictions! In this episode, Zac, Pete, and Ishan break down the results of Selection Sunday and provide initial thoughts on the field of 68 teams that made it to the tournament. Will Kansas be the first 1 seed to fall in the first round? Will Virginia make it through its gauntlet? Will Oklahoma be able to win more than once? We break it all down and more. Follow us on Twitter @3rdStringPod, @ZacCrippen, @Ishan_Nath, and @Pete_Laclede. In part one of our MLB preview trilogy, we break down the American League and National League East, looking at offseason acquisitions, storylines that will determine the direction of the 2018 season, and over/unders for win totals. We also chat briefly about March Madness (full tournament episode is dropping next week!) and the NFL draft combine. We're also announcing our fantasy baseball league--the first dozen listeners to respond get to play with us this year! Reach out on Twitter @3rdStringPod or to 3rdstringpod@gmail.com. Special thanks to Dodgers ballpark organist Helen Dell for our intro/outro music! Zac and Pete provide instant reax to the new details emerging from Yahoo Sports with respect to the NCAA basketball corruption scandal. We're Back! After taking 2 weeks off, Zac was finally able to stop celebrating long enough to sit down with Pete and Ishan to discuss all things basketball. This week, the guys talk about some of the surprises in the NCAA, debate the pending sanctions that could shock the world, and give quick reactions to NBA All-Star Weekend. Finally, the guys talk about what's going on with Team USA after one week of competition in South Korea and whether they are taking the bait on Tim Tebow making it to The Show. Emergency Pod--Philadelphia Wins the Super Bowl! It was the Empire vs. the Rebels. Darth Vader vs. Obi-Wan. Good vs. Evil. And the good guys won, 41-33. In this brief emergency pod, Zac and Pete provide rapid reactions to the the Eagles' riveting victory over the Patriots in the Super Bowl. In this episode, Zac, Pete, and Ishan break down some key matchups in Super Bowl LII, make their score predictions, and then pivot to the basketball world where Trae Young is getting a lot of draft buzz, the Cavs are falling apart, and there's whispers of LeBron going to play for the Lakers. It's a fun conversation and you should let us know what you think! Zac and Pete take ten minutes to quickly break down the Alex Smith trade, which is particularly devastating for Pete. Zac and Pete are at it again! After their bad NFL Wild Card and Divisional picks, the guys bring in an expert this episode, “Saw” LaMonaca, to give his own Super Bowl prediction, as well as break down the gambling scene around it. Saw talks through the line, his favorite prop bets, and even the Music City Miracle. Take the safe bet and listen to this episode to get ready for the Super Bowl! In this episode of 3rd String, Zac and Pete talk about Alabama’s 451st consecutive championship title, Wild Card Weekend surprises, the crazy Divisional games this past weekend, and the upcoming AFC and NFC championships. Along the way, the guys talk about Nick Saban’s new Corvette, Seth Wickersham’s palace intrigue, and Georgia Tech’s Josh Pastner. Subscribe on iTunes, Spotify, YouTube, Google Play, or wherever you get your podcasts! Zac and Pete ring in 2018 by going all in on football. The guys start off with bowl game reactions by talking about surprises and disappointments, before moving on to disagree about draft stocks and what teams should look for going forward. 3rd String also welcomes Jamie Appletoft, an expert on FCS play, to talk about this weekend’s highly anticipated FCS national championship between the NDSU Bison and JMU Dukes. As always, send the guys your questions, comments, and beer recommendations! Joy to the Sports World! ‘Twas the day after Christmas and all through the land, not a sports fan was unhappy, except for the 385,000 people in Cleveland. Zac and Pete talk about assembling children’s Christmas presents, the sorry state of NFL replay, the new early signing period for college football, and the always exciting Las Vegas Golden Knights. They also tackle some great (and some hurtful) listener questions. As always, send us questions, comments, and beer recommendations! Follow Zac and Pete on Twitter. BONUS EPISODE: We're going bowling! Pete and Zac dissect the upcoming menu of Turkey Bowl games this weekend, including the Miami-Pittsburgh showdown, Ohio State taking on Michigan in the Big House, and the Iron Bowl. We also talk about Baker Mayfield's Heisman campaign, the unstoppable New England Patriots, the recent MLB MVP awards, and Pete (once again) brings up Lane Kiffin. It's a fun conversation and you don't want to miss it! In episode 5, Pete and Zac break down game 7 of the World Series, talk about George Springer’s MVP performance in the whole series, and discuss the new College Football Playoff Committee rankings, Lane Kiffin’s Twitter antics, why the CFP needs to include eight teams, and Pete’s frozen beer in North Dakota. In this World Series edition of 3rd String, Ishan, Pete, and Zac combine forces to provide commentary on the best moments of the World Series so far, the surprising offensive performances from both teams (Joc Pederson and Josh Reddick), Cody Bellinger's struggles at the plate, the game 4 pitching matchup, bullpen management, Yuli Gurriel's inflammatory gesture, and what will happen in games 4-7. It's a lot of fun and you should check it out! In episode two, Ishan breaks down what to look for in the WNBA finals and lends his thoughts on the new-look Oklahoma City Thunder in the aftermath of the Carmelo Anthony trade. Zac & Ishan banter a bit about the NL MVP race and Zac brings on 3rd String guest Pete Laclede to break down the Hokies' upcoming battle with the Clemson Tigers. 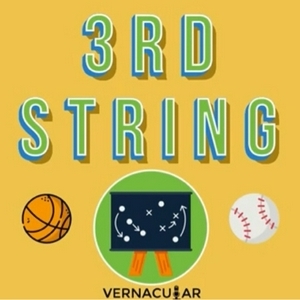 3rd String, the newest podcast from Vernacular, is a weekly dissection of sports and news from two amateur, bench warming, 3rd string analysts named Zac & Ishan.